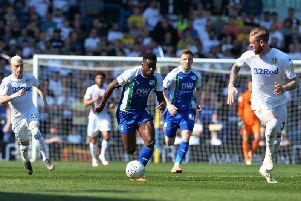 Latics boss Paul Cook could certainly have chosen more comfortable fixtures to come over the next week than back-to-back trips to Bristol City and Hull. But it’s imperative Latics find a cure to their travel sickness – or risk being in the wrong place at the wrong time when the Championship music stops next month. With seven matches to go, Latics currently enjoy a four-point buffer over the drop zone – where let’s remember they’ve yet to be all season. But the finishing line is in sight...and the pressure is on. It’s no secret Latics have the worst away record in the Championship – with only one win and three draws from 21 matches in all competitions. By Cook’s own admission, their impressive home form has been keeping their head above water all season. But he’ll also be well aware that can’t be relied upon to remain the case down the home straight. After the trips to Bristol and Hull, Latics have the small matter of league leaders Norwich City at home. Followed by a daunting Good Friday trip to second-placed Leeds United. Followed by an Easter Monday home game against play-off-chasing Preston – who hammered Latics 4-0 at Deepdale last October. The penultimate game is at Birmingham who, following their recent points deduction, may still need to find something themselves. Then it’s a final day visit of Millwall, which no-one wants to be a relegation decider. Especially not Greater Manchester Police. Therefore, a positive return from the next couple of games would be a godsend for Cook and his players. If they play like they did in their last away game, at Blackburn, they’ll have their work cut out to get anything. If they play like they did at Reading four days previous – when they were robbed of three points – they’ll give themselves a big chance. Managed to complete a rare DW double at the weekend by taking in the Warriors’ emphatic victory over the Catalans Dragons as Latics’ 0-0 draw with Brentford. Just as impressive as the Warriors attack was the state of the playing surface. Those in charge of its upkeep have received deserved criticism in recent years for it falling below acceptable standard. So credit where it’s due...it’s looking in absolutely cracking nick!